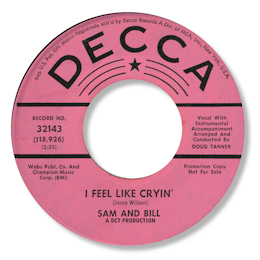 I’m a real pushover for those male duos that roamed the soul scene in the 60s and then seemed to disappear as though someone had clicked a switch, and Sam & Bill made a couple of discs that put them far out from the crowd. Originally the duo comprised Bill Johnson and Sam Gary who met in New Jersey around 1962when Gary, who hailed from Columbus, SC, sat in with the band Johnson was fronting, the Soul Brothers, as a guitarist, but the way he harmonised the vocals convinced both men to form a duo. Gary was pretty new to the music business but Johnson had been around for several years. He was born in Augusta, GA on 16 October 1932 and after an upbringing that included singing in gospel choirs, turned to R & B in his teens and formed his own group called the Four Steps Of Rhythm. Although the group played locally for some years they never cut a record. Bill, now calling himself Blues Boy Johnson, went solo cutting for the local Talos concern and then in Memphis for Sun. 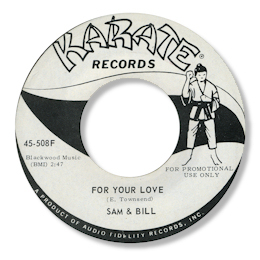 He and Gary’s first 45 was for New York based Karate and I have a soft spot for their take on Ed Townsend’s immortal For Your Love. Their voices are just great right from the first line you hear, really soulful and full of gospel fire. The pianist is first class too. The guys joined Johnny Nash and Danny Sims Joda label later in 1965 and they put the disc out again getting the duo into the lower reaches of the Billboard charts. Sadly their follow up – and Johnson’s own solo 45 – for the company were nowhere as good. After these disappointments Sam Gary left and went back to playing guitar with the Soul Brothers and Johnson found a replacement in Sam Davis, who came from Winston Salem, NC, where he was born on 10 December 1940. He’d played in local bands like the Invaders and Sammy David and the Two Jays, and no doubt arranged the duo’s next recording sessions for North Carolina’s Doug Tanner who cut them in nearby Greensboro. Two 45s were leased out to Decca, and both of them were in the Premier League of deep soul. I really can’t pick a favourite from I Feel Like Cryin’ and I Need Your Love To Comfort Me as both have some sensational singing and the sort of classic southern soul arrangements I love to bits, as well as perfect chord structures to boot. Perhaps the best thing is to just listen to one after the other and just drift away to Nirvana. 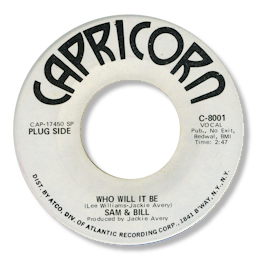 The duo’s next single was for the newly formed Capricorn label in Macon, GA and once again this was a fine double sided slab of southern soul. “Thing’s I’d do” is a lively strutting number full of punch and toe tapping goodness. The flip Who Will It Be is another killer ballad which has never had the appreciation the production and vocals deserve. Their final 45 was cut in Nashville by Bob Riley who leased out the result to Lelan Rogers who certainly put out promos of the fine southern funk of “Come On And Show Me” but whether any commercial copies were pressed up is debateable. Note ~ These are rumours that the Sam & Bill on Capricorn weren’t the same guys and were in fact the writers Jackie Avery and Lee Williams. Can anybody shed any light on this? Thanks to Davie Gordon, Mel and others on the Soulfuldetroit forum for extra info.